Learning to ride a bike starts at a young age in our family, not from doing, but from being a part of a lifestyle. As my husband says, there are two non-negotiables in this family: biking and skiing. Biking is at the core of our relationship, so we are intentionally fostering a love of bikes at the heart of our family. Learning starts with a spark and this seems to materialize when we are inspired by the positive actions of those around us. The spark for biking can be kindled at a very young age these days, with the advent of balance bikes and high-quality, lightweight children’s pedal bikes. And, to keep the spark alive, it’s important to keep riding fun and low pressure! Kids learn heaps from monkey-see-monkey-do, for better or worse. For worse, when in a moment of frustration you let a swear word fly and next thing you know your barely talking toddler is mimicking your very words (come on, we’ve all done it, right?!). For better, when you your kid insists on biking to preschool because that is how Dad gets to his job (and your heart swells with pride and joy). The kids and I get around by bike or on foot for our day-to-day, i.e. We often bike altogether on the weekend. Biking is all around our kids, from our own ingrained habits to simply living in a few blocks from Calgary’s unreal network of pathways and cycle tracks. Here are some of the ways that we have carried our kids by bike, starting at an early age, and even more ideas I’ve yet to try! Little kids can learn to ride a bike at an age much younger than you or I ever did. The mainstreaming of balance bikes has allowed for this and now there are even more options for balance (aka run) bikes out there than when my own kids started riding just a few short years ago! We got our eldest a run bike when she was about 18 months old, give or take. She mucked about with it in the back yard, walking beside it, straddling it and walking, but she didn’t really figure out the whole gliding thing until the next year, when she was 2 and a 1/2. We bought a bike with a hard seat by accident. This was fine at first because our eldest was still in massive cloth diapers, so she had all the cushioning in the world! Tip: Make sure the bike is comfortable! A lack of other kids to show her how it’s done. Tip: Peer pressure and modelling can be very effective! Either that or it was her more cautious and ‘thinking’ personality. Regardless, she was happy and loved her bike, which is the perfect first step. The next spring, the seat was definitely too hard for her potty-trained tush and we were wondering why she was losing interest after loving playing with her bike previously. I realized that I could buy a padded seat and it proved to be the ticket. Instantly she was trying to glide the bike in our back yard and within the week she riding around the park in her party shoes, no less. Kid number two learned how to use a run bike quickly and I believe that being able to watch her big sister has helped her out a lot. She started mucking about on the bike inside during wintertime when was about 17 mo as she could just straddle and barely sit on the seat if she didn’t have the extra bulk of a diaper. That spring she insisted on bringing her bike on our walks, even if she only rode — I mean, straddled and walked — her bike for a block or two. For the past month or so, you could see teeny glides here or there and then, all of a sudden, she got the hang of it when we were down on the bike path walking the dog one day and, bam, she biked 2 km at less than 2 years old. There are two things that I recommend looking for in a balance bike: weight and standover height. You want your kid to be able to straddle the bike as soon as they are interested in riding! Weight is important for two reasons: you don’t want your kid encumbered by a heavy bike that they can’t walk with or easily right on their own. Plus in order to use it lots, you want it light enough to throw on the back of your Chariot so that you have it on hand as much as possible and can stash it if fatigue sets in. We used a Strider as it was the lightest on the market at the time. There are many more options out there nowadays, with new ones on the market every year. I tried getting ours used off of Kijiji but I was never fast enough to snag one, hopefully you’ll have more luck. Consider trying to find a model with a hand brake, too. Check out the prices on Strider brand bikes. I truly believe in the power of balance bikes and how they can scaffold learning to ride a bike for even the littlest of riders. Your kid may pick it up quickly (like my second) or may take a few months or even a year (like my eldest). Alas, they are not the magic bullet for every kid. 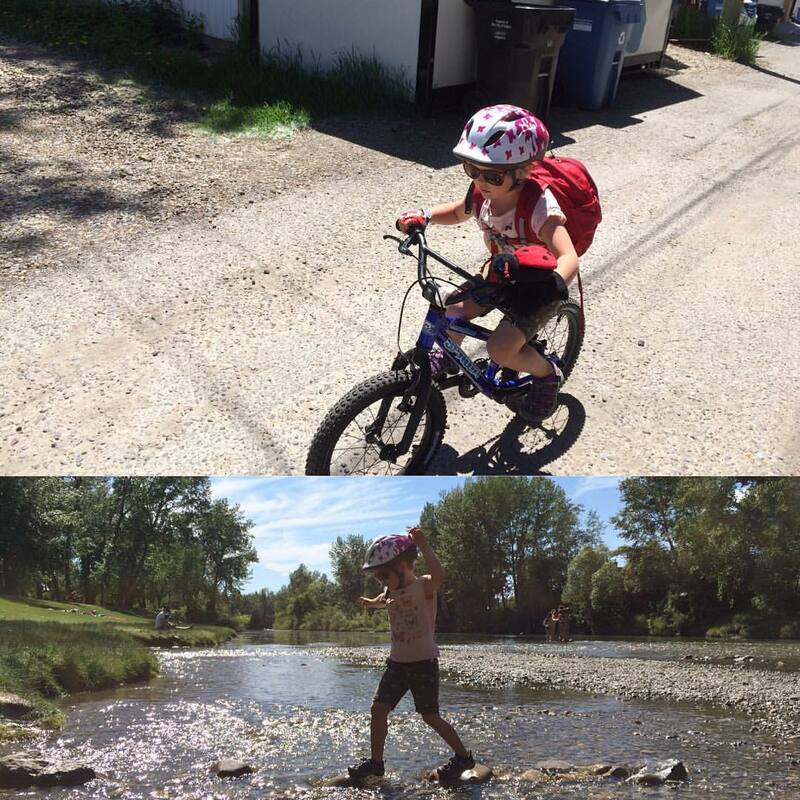 Never fear, your kid will learn to ride a bike, likely with stabilizers (like you and I did), and that’s okay because they’re learning to ride a bike! Learning to ride on a balance bike helps to break the learning to ride process down into bitesized chunks for kids. hand-eye coordination required to steer and move while simultaneously keeping upright and travelling forward. Next step adding braking and then pedaling! If you want (or need!) to introduce braking earlier, there are a handful of balance bikes out there that have a hand brake — extra useful if you have a kamikaze toddler who needs to slow down a little bit. But, also great for helping to teach braking before having to deal with pedaling, too. We didn’t go that route, but my sister added the brake accessory to a Strider for her fearless middle child. 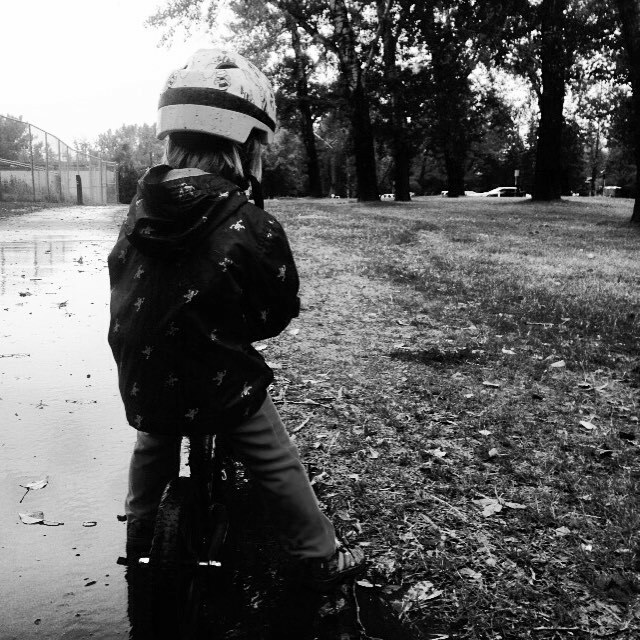 Just as when selecting a balance bike, weight was our primary concern for a pedal bike, mostly for our daughter’s sake, but also because I wanted to be able to throw the bike in our Burley, if necessary, as I had with the Strider. We researched pedal bikes for our eldest when she was 3.5 yo and settled on getting a Spawn but we weren’t sure if she was a Furi or Banshee size so we went to a store that carried them and they only had the Banshee in stock. It looked a bit big, but we were hoping that since she had already mastered the tricky part of balancing and steering that it wouldn’t be a big deal. It’s true, some kids aren’t worried about fit — I still remember riding my parents’ huge road bikes when we were 10 or so, ripping around the neighbourhood some how in spite of them being way too big: kids push through for the love of doing something. Other kids need to be able to solidly rest their feet on the ground, and and this was the case with our ‘thinking’ eldest. It was pretty cool, she more or less got on the bike and managed to do it all by herself in the driveway. But, then she had a wobble and it knocked her confidence because she could only touch down precariously on tippy toes, so she had trouble starting and stopping. This step back, after being so independent and competent on the balance bike, kind of killed it for her and she just wanted to ride the Strider. Lesson learned: don’t try to save money by buying the bigger sized bike. When she was 4 and her 15 month old sister was really starting to get interested in the Strider we decided to bite the bullet and get the appropriately sized bike — the Spawn Furi — which was actually on the smaller size now, but we figured our second would be on it shortly if her enthusiasm for biking held up, so we weren’t too stressed about the added cost (plus, these things hold their value for resale, big time). Tip: Starting looking 6 months ahead of time on kijiji if you prefer to buy used and keep your fingers crossed that you are the first to reply to an ad as they go like hotcakes! To help the big kid regain her confidence and to learn how to use the hand brake, I took off the pedals on her new bike and she rode it back and forth to preschool just like a balance bike. About a week after doing this, maybe ten days, on a Saturday, she said she wanted the pedals on and voilà! Pedal biker! Totally confident, no probs. She spent a month on this smaller bike and then one day we asked to see if the bigger bike fit her and it did, she liked it, and we haven’t looked back. In spite of an initial setback after great success with the balance bike, her foundation skills were there and when given the right equipment she took a huge leap forward! Read your kid. We should have known that our eldest wouldn’t be flexible about bike size and that it would rattle her confidence as she can be timid about taking risks. Maybe you are lucky, and your kid is fearless! Either way, I recommend not getting a bike they will grow in to. Try to find something where their feet can be more-or-less flat on the ground, something that isn’t a big change from their balance bike. Our youngest daughter insisted on pedal biking last summer at age 2.5. By mid-summer she could finally reach the brake (but not really touch down) and she put together pedalling quickly, needing help to start and stop. Once she had grown a teeny bit more she was off to the races and independent! It was wild to watch. Although biking may be what we call a non-negotiable in our family, we still have a sense of humour about something that sounds so serious and strive to keep things as fun as possible! That includes visiting local bike-friendly establishments for delicious treats (what can I say, my kids are food motivated), as well as playgrounds and bike meet-ups with friends. We also don’t push their limits. There’s a difference between having them excited to ride the whole 8 km before they gorge themselves on their chocolate croissant, but needing to take some breaks and check out the views along the way, and lording said croissant over them. With the Xtracycle U-Tubes on our Edgerunner longtail cargo bike, we just pop in either or both the Spawn Banshee or Strider (well, the run bike is still small enough to just lash on with the cargo bag clips). This works just awesome for either tired kids en route or unmotivated kids to start, helping to keep riding positive and have the girls learn their own limits. Check out these 5 tips for raising mountain bikers, for more inspiration. How have you managed to pass on your love of riding bikes to your kid(s)? I would love to read your comments below, on Facebook, or Twitter. Knowing your kid is definitely a huge part of it. Mine are so different from each other, and from my friend’s kids. The oldest is cautious and wanted nothing to do with a balance bike until she was 3 1/2. The younger one picked it up at ~22 months and within 6 weeks was bombing hills on it. He’s 2.5 and insists on test riding every balance bike we see in the local shops and has favorites that he prefers (in addition to spending as much time as we will allow on his Strider at home). Starting on a smaller pedal bike was super important for the oldest. I’m anticipating it not being a big deal for the younger one. The only thing I’d add is that for both of my kids I think that having a couple of tricycles around was really helpful to laying some of the foundation for bike riding. The oldest benefitted a lot from understanding pedaling as a result of having her tricycle. The younger one was able to jump in to the balance bike so quickly once he decided he wanted to try because he’d had a push tricycle (the flybike) available from the time he was 18 months. They might not be necessary but both kids have really enjoyed them and they seem to have helped, rather than hindered, their bike riding ability.